When I was about ten years old, my Dad went to a school auction and bought several wooden student desks for me. I set up my first classroom in our basement and invited the neighborhood to “play school”. We had a great time doing our version of “summer school” and I launched my career as a lifelong learner and teacher in my small hometown community, Manning, Iowa. I pursued my passion for education at Iowa State University (BS in Child Development/Early Childhood Education) and then went to Truman University in Missouri to teach in an Early Childhood Lab School and go to Graduate School in Special Education. After completing my Masters degree, I bought my first pair of hiking boots from an REI catalogue and headed west to the mountains. When I arrived in Seattle, I became a Kindergarten teacher and then a First Grade teacher at Bertschi School, an independent school in the Capitol Hill neighborhood. Ten years ago I joined Seattle Public Schools as a Special Education teacher and then became a multi-age 3rd-5th Grade teacher. 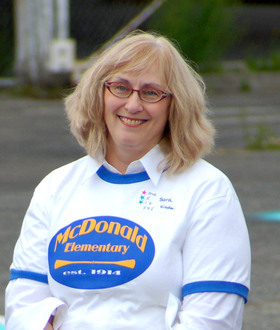 I've been with McDonald since the school reopened in 2010, and happy to be teaching Kindergarten and 1st Grade again. I’m really looking forward to working together to build a dynamic, child-centered learning community - it’s an extraordinary opportunity for me and I’m thrilled to be part of it!